According to the article, the legal system should be less concerned with equalizing placement time than with encouraging parties to developing parenting plans to deal with the ongoing issues of raising children. In an artificial world, this would make a lot of sense. In a real world, not so much. If there has been any huge change in the thirty years I’ve been a divorce lawyer (if you’re counting, I started at age 4), it has been the shift to equal placement time. When I started, it was still routine for mothers to get custody (the “tender years doctrine” still applied) and fathers typically would get alternate weekends and one evening during the week. Fast forward to today. While equal time is not mandatory, it might as well be. Absent extreme circumstances (e.g., abuse allegations, DV, geography problems or trouble children) equal time is almost guaranteed. Is this good or bad? If you look at my past articles on my office website, I have continually argued that, for most children, it is more important that their parents not fight than for any particular placement schedule. In most cases, the difference between a 9/5, 8/6 or 7/7 schedule (on a two week basis) is less important to a child than the absence of conflict. Parenting plans came into being a number of years ago as a means of forcing parents to consider various issues, present and future, and suggest means of resolution. 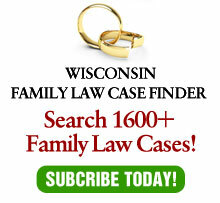 While still in Wisconsin statutes, I can’t think of the last time I had a client prepare one – or saw one from the other side. In an intact marriage, discussing many issues regarding children can easily create conflict. Now, add in the trauma of the divorce, new spouses or S.O.s and the stress of two families with different schedules and is it really a good idea to force parties to discuss these issues? Sometimes, avoidance is a good strategy. Of course, not everyone agrees with, including the author of this article. And, certainly there are some cases where the parties could benefit from parenting plans. But, in my experience, in the real world, sometimes it is preferable to just leave bad enough alone and not make it worse.